The Prescott Fire Department has held in trust all items the community left at Station 7 and sent from around the world mourning the loss of the Granite Mountain Hotshots on June 30, 2013. Community members called for action on the items, and recognize the need for a place to commemorate the nineteen fallen hotshots. Over the ensuing months, a nonprofit group was born: The Granite Mountain Interagency Hotshot Crew Learning and Tribute Center. OUR MISSION is to establish and operate a wildland fire learning center that honors the Granite Mountain Interagency Hotshot Crew (GMIHC) by telling their story, displaying and housing artifacts/memorabilia, and educating visitors about wildland fire, firefighting, and prevention. Since opening on June 30, 2018 to December 31, 2018 there were 14,919 visitors to the Center, from 44 states and 10 foreign countries. The Center was open a total of 84 days, with an average of 178 visitors per day. On the one year anniversary of their deaths, the Prescott Fire Department sponsored "A Fire Department Remembers" in the Hotel St. Michael ballroom. The exhibit recalled the men as firefighters and gave a brief overview of the history of the Granite Mountain Interagency Hotshot Crew. Volunteers from the Granite Mountain Memorial Project helped create and staff the exhibit, which featured over 200 firefighter t-shirts and memorabilia including a forest of live trees provided by Watters Garden Center. Over 5,000 people visited the one-week exhibit including many alumni of prior Granite Mountain Hotshot crews. Volunteer and retired Orange Fire Captain, Dennis Bueschel, and Curator, Katie Cornelius, were brought on as City of Prescott volunteers to oversee the collection in the spring of 2014, and they headed up all volunteer efforts as the Granite Mountain Memorial Project through 2018. The 4-year anniversary of the Hotshots death in 2017, along with the intention of the City to sell Station 7 and the release of the movie, Only the Brave, renewed interest in the items left on the fence. Community members called for action on the items, which had been safely stored on Prescott Fire Department property, and asked if Station 7 could be used as a museum (the Station was later sold via public auction in the summer of 2017.) Spurred by the public, Fire Chief Dennis Light and the City of Prescott called together approximately 30 stakeholders and community members to a late summer meeting in 2017. 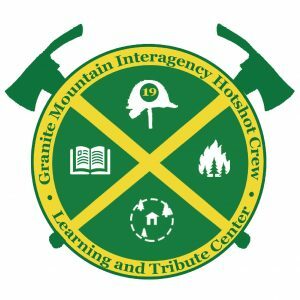 Over the ensuing months, a nonprofit group was born: The Granite Mountain Interagency Hotshot Crew Learning and Tribute Center. The City of Prescott has partnered with Prescott Gateway Mall to realize the hopes of many with the opening of the Granite Mountain Interagency Hotshot Crew Learning and Tribute Center. and the center is operated by volunteer docents. 100% of your donation goes to sustaining and operating our Center, located in Prescott, AZ.